The following article of mine was recently published in the July-Sept 2015 issue of Bibliotheca Sacra. It is a more academic treatment of my post: “Important or Impotent: How Many Sons Did Absalom Have?” posted last year on this blog. 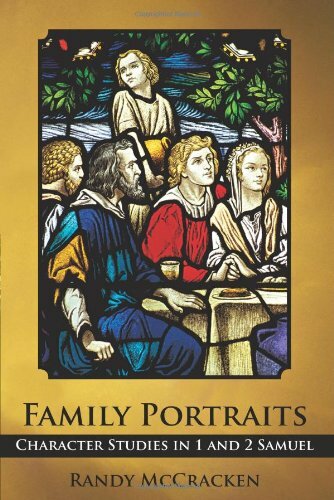 Both articles are based on the research from my book Family Portraits: Character Studies in 1 and 2 Samuel. This article is reprinted with the kind permission of Bibliotheca Sacra and Dallas Theological Seminary (© 2015 by Dallas Theological Seminary). Footnotes can be found following the article. The apparent contradictory statements about Absalom’s sons, or lack thereof, in 2 Samuel 14:27 and 18:18 have puzzled readers and scholars. This article seeks a new solution by proposing that the author of these texts deliberately created this ambiguity in order to communicate an important message about Absalom. Through the use of apparent contradiction, inclusion, and point of view, the author skillfully linked these two passages. The message communicated is a surprising reversal of Absalom’s image who is pictured before his rebellion as someone important, but by the rebellion’s end is portrayed as impotent. Anyone reading the account of Absalom’s rebellion found in 2 Samuel 13–20 is struck by the apparent contradiction between 2 Samuel 14:27, which states that Absalom had 3 sons and 1 daughter, and 2 Samuel 18:18, which states that he had no sons. This article seeks a new solution to this problem by proposing that the author of these texts deliberately created this ambiguity in order to communicate an important message about Absalom. The message conveyed is a surprising reversal of Absalom’s portrayal. He is pictured before his rebellion as someone important, but by the rebellion’s end is portrayed as impotent. The conflict in these two passages is really not about how many sons Absalom had (although it is this apparent contradiction that invites the reader to compare the texts), but the contrast between the image that Absalom projected and the reality of who he was. In recent history, two solutions for the apparent contradiction of 2 Samuel 14:27 and 18:18 have been proposed. Furthermore, scholars who propose one or the other of these solutions sometimes take different paths in arriving at their conclusions. The first solution, proposed by some literary critics, is that the two passages are from different sources (i.e., different authorial hands) and are therefore contradictory. For example, speaking of 2 Samuel 18:18, McCarter writes, “This parenthesis is evidently a late redactional notice introduced to identify a monument well known in the time of the redactor who added it.” Thus, McCarter follows the reasoning of some before him who see 2 Samuel 18:18 as an etiology about Absalom’s monument. According to this explanation, it would appear the redactor was more concerned with explaining the continued existence of Absalom’s monument in his own day, than he was with contradicting the earlier passage in 2 Samuel 14:27. Such a proposal, although theoretically possible, makes this supposed redactor very clumsy and myopic indeed. Not all scholars sharing this viewpoint, however, agree that 14:27 has priority. Smith, for example, speaking of 18:18 states, “Of the two, this seems more likely to be original, as it is quite in place to explain why Absalom had a monument in the king’s dale” (italics his). Mauchline seems to be of the same opinion when he states, “There is no doubt that this section 25–27 has no relevance where it stands and interrupts the course of the narrative. This and the fact that 27 in its statement concerning Absalom’s family is in contradiction to 18.18 has convinced many scholars that these verses belong to a source other than that to which the bulk of chs. 9–20 belong.” This highlights an important problem with this hypothetical solution. Because the passages appear to contradict one another, these scholars assume that two different authorial hands must be at work. However, the fact that it is impossible to be sure that the texts were added by two different hands (evidenced by the confusion over which text has priority) leaves open the possibility that both passages come from the same hand. If there is a plausible explanation for considering both passages to be from the same authorial hand, then such an explanation should be considered superior to the “two hands” theory. A second problem with this solution is that it may prevent the interpreter from seeking an alternate explanation and wrestling with the two apparently contradictory texts. They can be chalked up to a redactor (or even two redactors) with conflicting data or a conflicting viewpoint. A third problem is that it proposes an irreconcilable contradiction in Scripture. Robert Alter states, “The two reports can be harmonized only with considerable strain, and it is best to view them as contradictory traditions incorporated in the final text.” This is a surprising concession from Alter who helped pioneer the contemporary literary approach to the Bible with its emphasis on viewing the text as a whole and discovering the art of the bib­lical authors. The second proposed solution is that Absalom’s sons must have died in childhood. This solution is suggested by many recent commentators including Auld, Bergen, Chisholm, and Firth, to name only a few. Some merely deduce this from the silence of the text and offer no corrobo­rating evidence. Bergen, however, suggests that Absalom’s childless state is a result of a curse that is placed upon children of the disobedient (Deut. 28:18). Leithart, on the other hand, proposes that Absalom’s loss of sons “shows a similarity to David, who also lost a series of sons.” The suggestions of Bergen and Leithart at least take a more productive approach founded on factors in the wider context; nevertheless, an argument based on silence is at the very least precarious, and oftentimes mistakenly leads one in the wrong direction. The fact is that some are uncomfortable with ambiguity, and especially with texts that seem to contradict one another. The temptation is to find a quick answer to the problem and move on. However, it is possible that an apparent contradiction is an invitation to examine the text in greater detail. Could it be that by attempting to solve an ambiguity in the text too quickly or superficially, readers fail to see its intended function and, thereby, miss the intended meaning? What follows will attempt to demonstrate that 2 Samuel 14:27 and 18:18 are deliberately ambiguous in order to communicate a particular message. However, before looking at these texts, it is necessary to take a brief look at the meaning and function of ambiguity and whether it can be discerned as a device used in the books of Samuel. Recently Firth has examined the concept of biblical ambiguity. He utilizes a definition of ambiguity as “any verbal nuance, however slight, which gives room for alternative reactions to the same piece of language.” Firth also notes three different types of ambiguity. First, ambiguities may be the result of an author’s intention. Second, ambiguities may occur in a text unintentionally (e.g., does Saul or Samuel tear Samuel’s robe in 1 Sam. 15:27?). Third, ambiguities occur due to a reader’s misunderstanding or lack of knowledge. Firth’s focus, and the focus of this article are on the first type of ambiguity––that which is intentionally created by the author. Next, it is important to recognize the different types of ambiguity that an author may intentionally utilize. Firth proposes five different types. These include: 1) Details effective in multiple ways; 2) Multiple possibilities with a single resolution; 3) Simultaneous use of unconnected meanings; 4) Alternative meanings combine to clarify author’s intention; and 5) Apparent contradictions. The fifth type of ambiguity “apparent contradictions” preoccupies the present discussion of 2 Samuel 14:27 and 18:18. Firth lays down what may be called “the ground rules” for this type of ambiguity. The final type of ambiguity occurs when an author deliberately places together statements or concepts that appear to contradict one another so as to invite readers to see the ways in which they mutually interpret one another and cohere so as to create a single meaning. It is important to note that the contradictions employed in this type of ambiguity are apparent, not actual. . . . Where this type of ambiguity occurs, it is common for the apparent contradictions to be placed close to one another in order to highlight the paradox seemingly created by the contradiction, though it is not necessarily the case that this will happen. It is evident that 2 Samuel 14:27 and 18:18 fall into the latter category of verses that are not deliberately placed together. However, because they share the theme of sons born or not born to Absalom, the apparent contradiction ties them together. They also share other connections. Before proceeding with an examination of 2 Samuel 14:27 and 18:18 as an example of ambiguity through apparent contradiction, it is fair to ask if an authorial use of ambiguity can be found elsewhere in the books of Samuel. Firth maintains that one can not only find ambiguity in verbs (see the definition above), but that “it is also possible to create ambiguity through narrative techniques.” As a test case for this idea, Firth turns to the books of Samuel admitting, “Such a studied use of ambiguity has not normally been attributed to [them].” Examining three narratives involving Saul (1 Sam. 18:6–9; 20:24–34; 22–11-17), Firth demonstrates how category 1 (details effective in multiple ways) explains Saul’s actions, noting that “He is consistently portrayed as misunderstanding potentially ambiguous statements.” Furthermore Firth maintains that, “…through the ways in which Saul misunderstands, readers are brought to understand more clearly where his faults lie….” Other examples supplement Firth’s find­ing and illustrate how common the literary technique of ambiguity is in 1 and 2 Samuel. Here are two examples, focusing on the use of apparent contradictions (category 5). Yahweh’s command for Saul to “utterly destroy” the Amalekites in 1 Samuel 15, followed by the appearance of Amalekites in the chapters surrounding Saul’s death (1 Sam. 28–2 Sam. 1), provides evidence of the author’s use of ambiguity. Following Yahweh’s command for Saul to utterly destroy the Amalekites (1 Sam. 15:1-3), readers are informed that Saul utterly destroyed “all of the people with the edge of the sword” but “spared Agag” the king (vv. 8–9). Subsequently, Agag is put to death by Samuel (15:33), which seemingly puts an end to all of the Amalekites. However, in the chapters surrounding the death of Saul, readers are reminded that Saul was disobedient by not wiping out the Amalekites (1 Sam. 28:18), and Amalekites appear frequently (1 Sam. 27:8; 30:1-18; 2 Sam. 1:8, 13). The reappearance of Amalekites, long after it is assumed they have been “utterly destroyed,” often puzzles readers and appears contradictory. In fact, it is a masterful way of surprising readers and driving home the message that Saul was far more disobedient than it seemed at first. Other illustrations of ambiguity could be cited from 1 and 2 Samuel, but the above examples may be sufficient to establish that the books of Samuel use this technique. Now a close examination of 2 Samuel 14:27 and 18:18 can demonstrate that the supposed contradiction between these two verses is only apparent, while also proposing a reason for the author’s use of ambiguity in the narrative of Absalom’s rebellion. As noted above, 2 Samuel 14:27 and 18:18 immediately come together in the mind of the reader through the apparent contradictory information they offer. When one reads 2 Samuel 18:18 a “wait a minute” pause occurs as mental dissonance prompts the question, “But didn’t I read a few chapters earlier that Absalom had 3 sons?” Upon turning back and rereading 2 Samuel 14:27, dissonance turns to perplexity. At this point the interested reader (not to mention the sincere believer) is forced to grapple with these texts at a deeper level. While the apparent contradiction between these two verses might initially suggest a connection between them, further investigation reveals two other important links. First, the placement of these two verses is conspicuous. 2 Samuel 14:27 occurs immediately before the story of Absalom’s introduction to David’s court (2 Sam. 14:28–33), which preludes Absalom’s rebellion. Correspondingly, 2 Samuel 18:18 occurs at the end of the story of Absalom’s rebellion, immediately following the notice of his burial in verse 17. Therefore, these verses form an inclusio around Absalom’s rebellion. Recognition of the position these verses occupy in the narrative also suggests there is more to their significance than simply an apparent contradiction. It is the ambiguity, however, that draws attention to the significant placement of these two verses in the story of Absalom’s rebellion. A second link between these verses concerns their function and viewpoint, in that both verses interrupt the flow of the narrative by using a flashback technique. In 14:27 this interruption in narrative flow is an effective way of creating suspense. After David’s harsh words that Absalom is not allowed to see his face, the reader wonders, “Will Absalom ever be allowed back into the court of David?” Then comes 14:25-27, interrupting the narrative with a description of Absalom’s physical beauty and his procreative ability. These verses serve the dual function of: 1) causing the reader to wait and wonder what David will do, just as Absalom had to wait and wonder; and 2) introducing themes (vanity, sons) that will reappear in 18:18. In one sense, 14:25-27 and 18:18 could be omitted from the story and the reader would never miss them. They are an intrusion and this is why many scholars have viewed them as redactionary comments inserted into the story. On the other hand, their omission would dilute the powerful message of which they are an integral part. Rather than intrusions by a clumsy redactor, they are deliberate insertions by the author. They function together as part of the literary artistry of the narrative and contain an important message that the author wants the reader to understand about Absalom, as more detailed examination of both passages demonstrates. “Among all the various descriptions of beauty mentioned in the books of Samuel, none excels the description of Absalom who is beautiful ‘from the sole of his foot to the crown of his head.’ Indeed, there is ‘no blemish in him'” (2 Sam. 14:25). Verse 26 continues with a description of Absalom’s luxuriant head of hair. Physical descriptions are rare in biblical narrative. What should be made of Absalom’s beauty and the author’s focus on Absalom’s hair? Niditch has written about the significance of hair in ancient Israel. Her comments regarding Absalom are insightful: “It seems clear that Absalom is portrayed as trying to project a certain image with his hair. The long-haired man is special. It is no coincidence that this description is followed by the mention of offspring . . . the long hair is clearly associated with fertility and manly fecundity. . . . He looks as if he is meant to lead and as if God’s blessing is on his head. He will be an excellent warrior. . . . He is adept at projecting an image of power, an image to which the hair contributes.” Similarly, Brueggemann states, “He is handsome, and his hair bespeaks his power and viril­ity.” Thus, Absalom’s beautiful appearance, luxuriant hair, and ability to father children (espe­cially sons), indicate his eligibility for kingship. As noted above, it is not accidental that this description of Absalom is placed immediately before his reacceptance to the court of David which facilitates the rebellion. The description of Absalom’s beauty and power can work at several different levels. On the one hand, it might suggest that Absalom is the natural successor to David. Upon reading further, these verses could be read as an ominous warning that Absalom will usurp his father’s throne (2 Sam. 15:10–14). This concern is eventually alleviated by the statement in 2 Samuel 17:14b: “For the Lord had ordained to thwart the good counsel of Ahithophel, so that the Lord might bring calamity on Absalom,” and by the report of Absalom’s death in 2 Samuel 18:9–17. On the other hand, a discerning reader might also be mindful of the recurring theme that “looks can be deceiving,” which is reiterated throughout 1 and 2 Samuel (e.g., Eli, Saul, Eliab, etc.). In this case, the reader might anticipate Absalom’s demise, or be concerned that the kingdom is falling into the hands of an unsuitable candidate. Whatever the reader’s reaction might be, the statement that Absalom fathered three sons projects an image of power and future kingship, which is an important key to understanding the author’s purpose. Just as David had fathered many sons, demonstrating his ability to establish a dyn­asty (2 Sam. 3:2–5; 5:13–16), so Absalom also possessed the same trait. The irony that Absalom set up his monument in the “King’s Valley” also should not be overlooked. By this comment the author shows the reader that the monument set up long ago hinted at Absalom’s kingly aspirations. Now (in the author’s day) it had become a hollow memory. The books of Samuel only record one other individual erecting a monument to himself. In commemoration of his victory over the Amalekites, the act that would cost him his kingship due to disobedience, Saul had also erected a monument (1 Sam. 15:12). Thus, twice in the books of Samuel monument building (for one’s self) is connected with the loss of kingship. It turns out that Absalom shares a number of similarities with Saul besides monument building. Saul and Absalom were both “kingly” in their appearance (1 Sam. 9:2; 10:24), and both pursued David and tried to destroy him. Saul clung to a throne that had been given to David, while Absalom tried to take a throne that belonged to David. In the end, the Lord disposed of them both, while David lived on. Against this background the comment that Absalom had no son is very poignant. It is one more way that the author demonstrates Absalom’s failure. The man who looked so important in 2 Samuel 14:25-27, turns out to be impotent. Absalom’s celebrated virility turns to sterility in 18:17–18 as one stares at the heap of stones in the forest which have become his grave and hears him confess, “I have no son”! Far from a clumsy contradiction inserted by a later editor, the statements about Absalom’s sons, or lack thereof, become a powerful statement about one who appears to be something that he is not. The literary art of the author has unmasked Absalom’s true insignificance. Although the explanation above lauds the literary art of the author, there is still a problem. Did Absalom have sons or didn’t he? Even with allowances for literary art, it still seems as though there is a contradiction. Either the statement in 2 Samuel 14:27 must be true, or the statement in 18:18 must be true, but not both. Actually, this is where scholarly conclusions have gone astray, and where our previous discussion on apparent contradictions that create ambiguity becomes important. In fact, both statements are true, and a careful examination of both passages reveals that the contradiction is more apparent than real. It is important to notice who is speaking in each passage. In 2 Samuel 14:27 it is the biblical narrator who says that Absalom had three sons. This information should be taken as factual and reliable. As Meir Sternberg has stated, “The Bible always tells the truth in that its narrator is absolutely and straightforwardly reliable.” If this assertion is accepted, then there can be no doubt that Absalom did indeed have three sons. In 2 Samuel 18:18, the declaration “I have no son” is the narrator’s quote of a statement made by Absalom. Normally, if a character’s statement contradicts an assertion by the biblical narrator, then the character is either lying, deceived, or misinformed. But none of these can be the case with Absalom. Certainly Absalom would know whether he had any sons or not, so his statement should not be doubted. But could Absalom have been lying when he made this statement? The answer must be “No.” The monument that Absalom constructed was in a public place, and therefore, he gave a public explanation for its erection: “I have no son.” If Absalom said he had no sons, when in fact he had three sons, this would have been evident to others who knew him and, therefore, this statement would have exposed Absalom as a liar and a fraud. The solution to the dilemma is not who is speaking, but the timeframe in which these assertions occur. As noted, both passages are flashbacks. They do not take place at the time that other events in the narrative are happening. Both 2 Samuel 14:27 and 18:18 interrupt the flow of the narrative and take the reader back to a previous point of time in Absalom’s life. There is little doubt that Absalom’s three sons must have been born to him before the revolt. The revolt does not seem to have lasted very long, and in any case, it is unlikely that he could have given birth to three sons and a daughter during that time. Therefore Absalom’s children appear to have been born at some unspecified time in the past prior to his rebellion. So far, so good. Few, if any, would disagree with the explanation up to this point. The critical difference in interpretation is considering the time factor of Absalom’s statement in 18:18. Because the statement in 18:18 appears after the assertion in 14:27, many commentators assume that Absalom made the statement “I have no son” after his three sons were born, and therefore conclude that his sons must have died, or that there must be a contradiction. But such an assumption fails to take into account what is known about ancient historical writing, not to mention biblical narrative. Why must it be assumed that these statements stand in chronological order? In fact, the biblical author is very vague regarding the time of Absalom’s statement about having no son. The text simply states, “Now Absalom in his lifetime.” This could well mean that Absalom made this statement before he had any sons, especially since lifting an event from its chronological context is a common technique in the books of Samuel (e.g., 2 Sam. 4:4; 21:1–14). The author has simply pulled a statement from Absalom’s past that precedes the assertion of 14:27. The positioning of this statement here reveals that having no son was just a convenient reason for Absalom to erect a monument to himself in the King’s Valley. After all, he could not state the real reason (arrogance, self-indulgence, “I want to overthrow my father,” etc.). Therefore, the apparent contradiction (made possible by dischronologizing the statement) reveals Absalom’s hypocrisy in building a monument for himself and exposes him as the megalomaniac that he was. Readers have long noted the apparent contradiction between 2 Samuel 14:27 and 18:18. The discussion above has sought to demonstrate that the two usual solutions suggested to resolve this contradiction, (clumsy editor, Absalom’s sons must have died) are both inadequate explanations. Recognizing the art of intentional authorial ambiguity provides the best explanation for the apparent contradiction. The books of Samuel provide ample evidence of this technique. In attempting to solve this ambiguity, scholars have asked the wrong question. The question is not, “How many sons did Absalom have?,” but “At what point in time were these two assertions made?” Once modern presuppositions concerning chronological order are dispensed with, the solution becomes obvious. The writer’s imprecise language in 18:18 provides a further hint via the vague expression “in his lifetime.” The purpose of the ambiguity is to contrast what appears to be a strong, virile Absalom before the rebellion (14:27) with a true picture of the man evidenced by his weakness and impotency. Absalom’s monument is shown for what it really was: a testament to his vanity and pride. Through this contrast, the author highlights one of the key messages of the books of Samuel contained in the statement: “Do not look at his appearance or at the height of his stature, because I have rejected him; for God sees not as man sees, for man looks at the outward appearance, but the Lord looks at the heart” (1 Sam. 16:7). The following article is a more in-depth treatment of a conclusion reached in my recent book, Family Portraits: Character Studies in 1 and 2 Samuel, (Bloomington: WestBow, 2013), 364–365, 379–380. I am interested in looking at the final form of the text. Therefore by author I mean the person or people responsible for putting 1&2 Samuel in its final form, which most likely took place during the exile. Among recent commentators who take a similar view see, Robert B. Chisholm Jr., 1&2 Samuel, Teach the Text Commentary Series, (Grand Rapids: Baker Books, 2013), 6. P. Kyle McCarter, Jr., II Samuel, The Anchor Bible, vol. 9, (Garden City: Doubleday & Com­pany, Inc., 1984), 407. For example, Peter R. Ackroyd, The Second Book of Samuel, The Cambridge Bible Commen­tary, (Cambridge: Cambridge University Press, 1977), 169, and Charles Conroy, Absalom Absalom! Narrative and Language in 2 Sam 13–20, Analecta Biblica 81, (Rome: Biblical Institute, 1978), 65. H. P. Smith, A Critical and Exegetical Commentary on the Books of Samuel, International Critical Commentary, (Edinburgh: T & T Clark, 1899), 359. John Mauchline, 1 and 2 Samuel, New Century Bible, (London: Oliphants, 1971), 268. Robert Alter, The David Story: A Translation with Commentary of 1 and 2 Samuel, (New York: W. W. Norton & Company, 1999), 281. J. P. Fokkelman, King David: Narrative art and Poetry in the Books of Samuel, vol. I, (Assen: Van Gorcum, 1981), 150, n. 35, makes the same admission. A. Graeme Auld, I & II Samuel, The Old Testament Library, (Louisville: John Knox, 2011), 544; Robert D. Bergen, 1, 2 Samuel, The New American Commentary, (Nashville: Broadman & Holman, 1996), 394; Chisholm, 1&2 Samuel, 321; David G. Firth, 1&2 Samuel, Apollos Old Testament Commentary, (Downers Grove, IL: InterVarsity, 2009), 447. Peter J. Leithart, A Son to Me: An Exposition of 1&2 Samuel, (Moscow, ID: Canon, 2003), 280, n. 27. Firth, ibid. 151-186. Firth bases his insights on the work of William Empson, Seven Types of Ambiguity, 3rd ed. (Harmondsworth: Penguin, 1960). Empson’s work examines ambiguity as it is found in literature in general. Firth refines some of Empson’s categories and applies the insights to the biblical text. This article focuses on Firth’s contribution, while acknowledging the prior work of Empson. For my assessment of Mephibosheth and Ziba see Family Portraits: Character Studies in 1 and 2 Samuel, 165–182. For example, the contradictory accounts of Saul’s death as told by the biblical narrator in 1 Samuel 31 and the Amalekite in 2 Samuel 1. Similarly, R. N. Whybray, The Succession Narrative, (London: SCM Press, 1968), 27, notes the link between 14:25-27 and 15:1–6 (especially v. 6). McCracken, Family Portraits, 363. The comments which follow are adapted from my book. Susan Niditch, ‘My Brother Esau is a Hairy Man’: Hair and Identity in Ancient Israel, (Oxford: Oxford University Press, 2008), 79-80. Walter Brueggemann, First and Second Samuel, Interpretation Bible Commentary, (Louisville: John Knox, 1990), 296. The dishonorable nature of Absalom’s death and burial is seen in the way it parallels the death and burial of the Canaanite kings that Joshua conquered . Like Absalom, the kings were hanged on a tree, thrown into a grave and covered with “a great heap of stones” (Josh. 8:29; 10:26–27). This repetition is obscured by the NASB which uses the word “erected” in v. 17 and “set” in v. 18. Shimon Bar-Efrat, Narrative Art in the Bible, (Sheffield: Sheffield Academic Press, 1989), 178–179. Meir Sternberg, The Poetics of Biblical Narrative: Ideological Literature and the Drama of Reading, (Bloomington: Indiana University Press, 1987), 51. I have often wondered about the two passages. Thank you for showing more light on this subject of Absolom’s and having or not having sons. Good article. You’re welcome Helen. I’m glad you found it helpful. Thank you for the encouragement! Hey I’m so glad that this has been published. Have you received any feedback? Also, do you need to buy a copy of the journal or did they send you a copy? None yet, Lindsay. It will take some time. Probably years as the article is read. I did receive a prepublished copy of the article by email. I did contact BibSac and they told me they’d send as many copies as I wanted! I don’t know if they’ll ship them here to England or if I’ll have to collect them at my American address but I’m looking forward to getting a hard copy. Thanks for asking.